Four of 7 tanks of 2009 were racked to barrels. In particular, Tanks C and part of B, Camalie Cab harvested 10/14 went into barrel Q2; Camalie Cab harvested 10/3 from tank E and part of tank F went into Barrel Q4; and All of the Carmenere and part of A and b went into barrel C2. all french oak. The Carmenere ration to Cab in C3 is roughtly 50/50. I blended the Caremere aggressively with cab to get the acidity and alcohol levels up for better wine stability and taste. Blending in Cab did raise the score by 4 points in the tasting. See results above. Plan is to put the Konrad wine into a new french oak barrel after checking and adjusting its acidity. 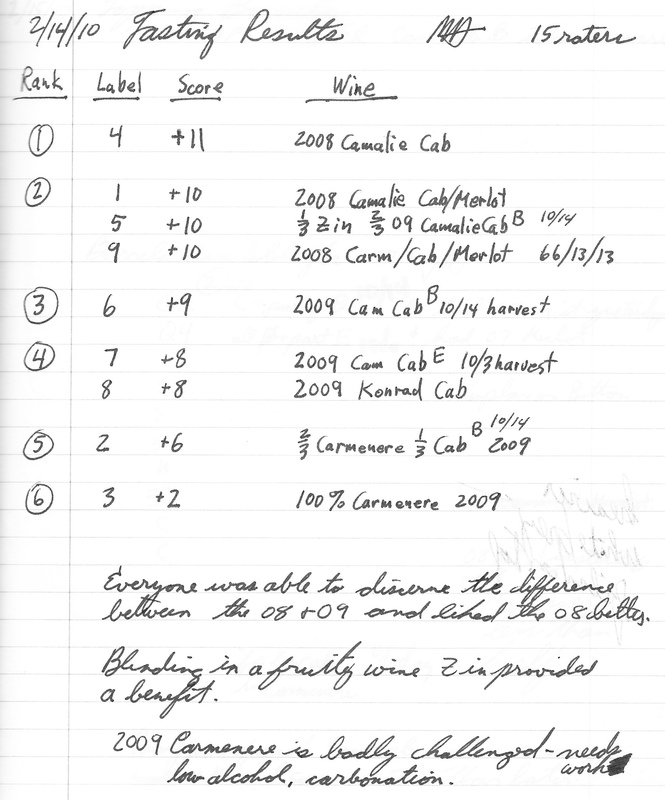 On Sunday 11/15/09 I did the following analysis of the wines. See data in the table below. Not all tanks were sampled because 3 of the tanks contain equivalent wines to those sampled. Some actions need to be taken based on this data most notably some kind of alcohol increase for the Carmenere to improve its resistance to spoilage and to improve its acid/alcohol balance. We have two options. The first is to blend the alcohol up with some of the Cab. My calculation shows that we would need to add an equal amount of the 15.3% cab to get the Carmenere up to 14% alcohol. This may dilute the Carmenere flavor excessively but, may not. A taste test of this blend would be in order. The second option is to add alcohol in the form of flavorless vodka which has typically 40% alcohol. I calculate that we would have to add .86 gallons of vodka to the 16 gallons of Carmenere to get to 14% alcohol. This represents a 5.3% dilution of the flavor,tannin and acidity components which seems reasonable to me since we have relatively good intensity, especially color. If we could find a source of higher concentration alcohol we could reduce the dilution. Adding some additional sulfite would also help protect against spoilage, another 20ppm on the 50ppm already there especially since the free SO2 level is very low at the high 4.29pH of the Carmenere wine. Actually bumping up the metabisulfite to compensate for the high pH but keep the same 50ppm free SO2 level may be the best approach. I need to look at the reference graphs of free SO2 vs. pH that are available. My plan is to make these adjustments this Wednesday when I innoculate the M.L. Fermentation in all tanks. The overall press yield was 317gallons/430 gallons or 74%. We now have 5.3 barrels of wine but will lose 5-10% when we rack off the lies to barrels. This will leave us with very close to our target volume of 4.8 barrels. On Saturday 11/14/09 we pressed the remaining 5 tanks of wine A,B,C,D and G.
On Saturday 11/7/09 we pressed the big tank, I, with the grapes from Dr. Konrad's vineyard and the two smaller tanks E and F which had grapes from the first Camalie pick in them. A total of 212 gallons of must was pressed yielding 166 gallons of wine which corresponds to a yield of 78% which is in line with expectations. Both wines tasted great, young but good tannin/acid/alcohol balance. The rest of the wine is done fermenting including the Carmenere and is ready to be pressed 11/14/09. We picked 1120 lbs. from the west most 3 or 4 rows of block K3U above the upper berm. On 10/3 we harvested 1113 lbs of Cabernet Sauvignon grapes from block 3 of Camalie Vineyards, crushed them and put them into tanks E and F. We also harvestd 1120 lbs. of grapes from block K3U of Konrad Vineyards crushed them and put them into tank I. On 10/17 we harvested another 1840 lbs of grapes from Block 4 of Camalie Vineyards crushed them and put them into tanks A,B,C and D.
On 10/25 we harvested 250 lbs of Carmenere after harvesting the last of the Camalie Cab for Sherwin Family Vineayards. The carmenere is inflicted with the leaf roll virus and has poor fruit set and trouble ripening, however, this handicap hasn't prevented the Carmenere from producing some very nice and unusual wines. This year the fruit set was about 50% better than last year but still no better than 20% of what the Cabernet Sauvignon set was. It just didn't ripen fully this year maxing out at 22.5 Brix and no more than an extra half brix in the last two weeks which should have increased the Brix at least 2 points. 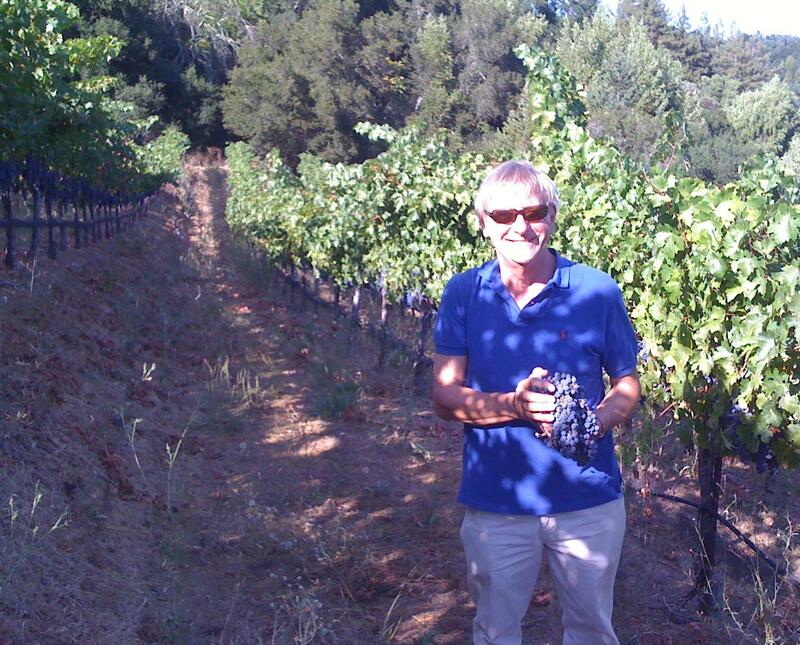 We harvested and crushed 21 gallons of must or 80 liters which ended up at 22.4 Brix in the tank. I targeted a 2.2% sugar increase to bring the Brix up to 24.6 Brix which would produce an alcohol level of just under 14% however, I made an error in calculation and added only 2.2% of the sugar weight instead of 2.2% of the total weight of the must which resulted in about 1/4 of the increase I was looking for. The alcohol level ended up at 12.6% which is very low and will require futher adjustment. After Crush we now have a total of 430 gallons of must in the following tanks. G, 25 gallons of must --------------------------25 gallons of Carmenere must 22.5 Brix, added sugar to get to 25.5 Brix. ~7.5 g/l T.A. ERROR only 1/4 of proper sugar dose added due to calculation error. 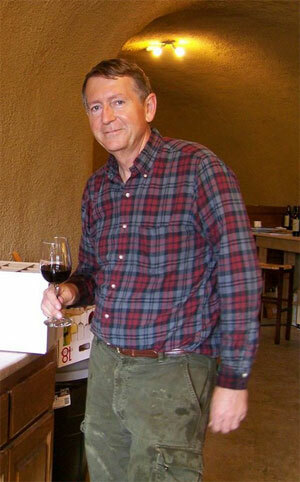 Dr. Konrad who contributed a barrel's worth of fruit from his vineyard this year.